A superb gaming phone with a wealth of smart features for everyday use. And it’s cheaper than most of its competitors. As mobile games get more complex, demanding, and specialist there’s an onus on mobile phone makers to accommodate them. The competition for the mantle of best gaming phone is getting increasingly heated, and the View 20 is Honor’s brave vanguard into this battle. It’s an Android-powered device with a lovely 6.4” screen, some impressively thin bezels around the edge, and a cutting edge processor inside. Crucially, it’s one of four devices that will happily play Fortnite on mobile at 60fps (along with the Huawei Mate 20X, and Samsung Galaxy S9 and S10), making for one of the smoothest experiences out there. But does that make it good for gaming as a whole? In terms of looks and size, it’s very similar to other high-end Android phones. Wrapped around the 6.4” screen, which is capable of displaying FHD 1080p, is a very thin bezel that almost creates the illusion of an edgeless screen. Almost. There’s a 25MP camera tucked away behind the screen, which is a lovely touch, and there’s an incredible 48MP main camera on the rear. The finish is glossy and very, very black, which is an absolute magnet for finger-prints, so you’ll find it tough to keep this phone looking nice - without a case - especially with heavy gaming sessions. There’s a 3.5mm audio socket at the top of the device, which is a sensible place for it, given how most people use modern phones. It doesn’t interfere with your hands while using the bottom of the screen, and only becomes a slight nuisance if you’re in landscape mode. The sim card slots into the right side of the device, and there’s a simple volume toggle and standby button set flush into a gap in the bezel. Design-wise, this is an excellent phone, only removed from perfection by screen edges and a propensity to pick up smudges. This is an Android phone, which is currently running on version 9 (Pie), so it’s fully customizable with whatever widgets you need on both the home and secondary pages. It’s a sideways swipe to access your main apps page, while a downwards swipe brings up suggested / most used apps. Great if you’re upgrading from iPhone, but perhaps a little alien for other ‘Droid users. Inside the phone is where the most impressive action lies, with 6GB of RAM (in the version I tested), and 128GB of internal storage (again, in this model). That’s plenty for gaming, as even the biggest titles only require a 3-4GB install. You’ll fit plenty on here before having to selectively delete apps, which is good because there’s no option to extend storage with a micro SD card. Shame. The screen itself is capable of displaying 16.7 million colors, which is on a par with similarly priced competitors like the S9. The camera produces some absolutely stunning images, and the front-facing selfie-snapper has a couple of wonderfully useful additional features, including a beauty slider to make you, er, more photogenic, and an automatic mirror function for those wanting a more natural angle to their self-portraits. If camera is important to you, beyond gaming, the Honor View 20 absolutely nails it. Elsewhere there’s a powerful 4000mAh battery, and that is where the View 20 absolutely smashes rivals. A single charge was just under two hours, during our tests, from absolute zero to 100%. But it lasts for days, even under heavy gaming conditions. Playing Fortnite mobile for about an hour only eroded about 7% of the battery, which is incredible. Flicking to a free-to-play game with numerous ads serving into it (Bubble Pop!) and the battery still held its charge extremely well, despite the strain from constant switching and grainy ad footage. Overall, this phone has an impressive set of features, with the camera and the battery real highlights. And this is where it really matters for gaming. The View 20 handled all the games we threw at it, with ease. First up Fortnite mobile, which we played at the recommended 60fps. Finding a game was easy, and performance was excellent, with the shooter solidly locked into the target frame rate, even during busy firefights inside the storm eye. The Honor View 20’s screen is large enough to handle all the mobile controls and still offer a decent degree of control over the action. Picking up items and cycling through your inventory is easy, and the screen was constantly responsive, even near the edges. There was zero lag while playing over Wi-Fi, probably thanks to some smart tech designed to reduce online issues like the Triple Antenna (designed to avoid loss of signal if you cover it with your finger). Next I tried a single player experience: Life is Strange. While lacking a little of the color vibrancy of the home console / PC release, the game looks great on the View 20’s screen, never stuttering as you stroll Max through her time-bending adventure. The soundtrack comes through nice and clear, and it’s easy enough to hit the game’s fiddly little control prompts for rewinding time. While solo play probably isn’t what this phone was optimized for, it handles single player story gaming extremely well. Finally, I played a few sessions of Marvel Champions, the officially licensed brawler. Initially, the tutorial fight seemed stuttery and control seemed to lag slightly behind the action, which is the death-knell of any fighter. However, after this initial blip the phone again performed flawlessly, responding well to all my inputs as I used Spidey and Wolverine to smash a hole through the cast of the Marvel universe (and collect loads of random junk along the way). There were a few slightly sticky taps when navigating the main map, but it’s more likely a flaw with the game than the phone. Downloads were even super fast, thanks to the Link Turbo tech inside the handset, which allows superior download speeds and ping. 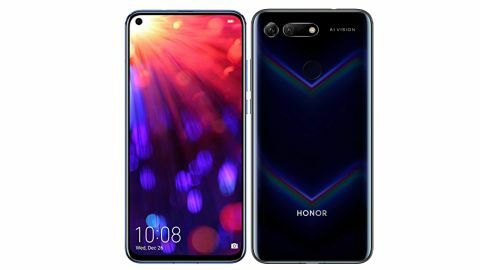 So, in terms of what you actually need for gaming, the Honor View 20 is a superb all-rounder. The short answer is: yes. The Honor View 20 is an excellent phone for almost everything you can throw at it, but is especially competent at gaming. The reliable and long-lived battery life, large screen, beautiful cameras, and wireless tech are real stand-out features, with only the finish of the handset and the lack of an edgeless screen the minor flaws in an otherwise excellent package. It handles Fortnite with ease, at the game’s top settings, and playing anything here won’t burn through the battery at any pace. The lack of SD card slot is a disappointment, but far from a deal breaker, and the powerful innards will mean that this phone keeps up with the very best for at least 2-3 years. And it’s all for a mid-range price of around £500 for the lower spec, and £580 for the higher spec. A remarkable phone, and the best one we’ve tested when it comes to gaming.